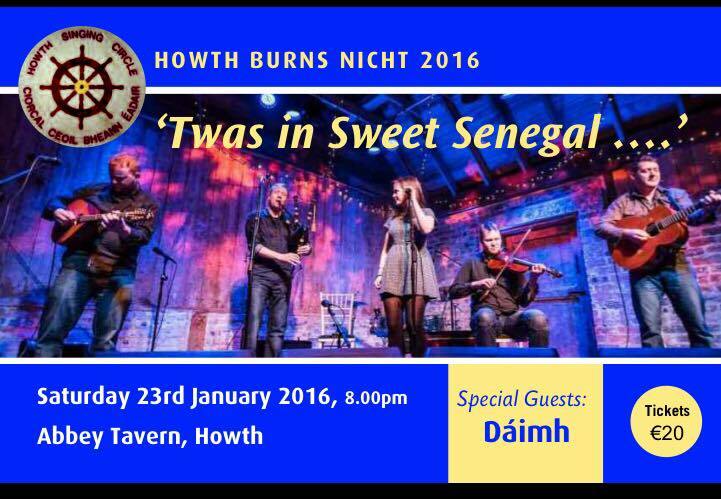 Burns Nicht 2016 is on Saturday, 23 January in the Abbey Tavern from 8pm with Special Guests Daimh and the St Lawrence Howth Pipe Band. Tickets are twenty euro and booking is essential. On Sunday 24 January, from 3-6, we have the Fare Thee Weel Session in the Angling Club. This entry was tagged Abbey Tavern, Dáimh, Howth Burns Nicht, Howth Singing Circle, HSC, Sweet Nightingale. Bookmark the permalink.